Small Sas Bahu temple, Gwalior Fort. bl.uk > Online Gallery Home	> Online exhibitions	> Asia, Pacific and Africa Collections	> Small Sas Bahu temple, Gwalior Fort. 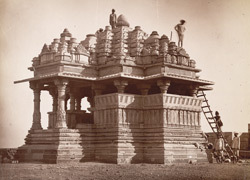 Photograph of the smaller Sas-Bahu temple at Gwalior in Madhya Pradesh, taken by Deen Dayal in the 1880s, part of the Bellew Collection of Architectural Views in India. Gwalior in central India is the site of a magnificent fort, perched on a rocky plateau, which changed hands several times over the centuries. In the 10th century the Gurjara-Pratihara dynasty of Gwalior declined, and this enabled the Kachchhapaghatas, a regional dynasty, to assert power. The Kachchhapaghatas built many monuments, including two temples known as Sas-Bahu (from the Hindi for mother-in-law and daughter-in-law), one small and one large, which are dedicated to Vishnu as Padmanatha. The smaller of the two now consists only of an open-sided porch with a pyramidal roof. The Kachchhapaghatas gave way to the Pariharas, who in turn were removed by the Delhi Sultanate in the early 13th century.